Spike wakes us up well before dawn. He makes it clear he has to go outside NOW. Oh, gee, Spike, really? Not about to argue, I pull on some pants, throw on a jacket over my nightie, slip into my shoes, put the suits on the crew, and we stumble out of the Casita. The morning is cool and the stars are bright. Spike immediately redeems himself by lifting his leg high on the nearest bush. Back inside, I’m wide awake so I fix myself a cup of tea. Bridget and Spike go back to sleep while I drink my tea and read the news online. Soon I’m sleepy again and curl up with my crew. It’s going to be another beautiful day. I think we’ll go to the beach again . . .
After we’ve had breakfast, I check the blog and read the latest comments. I’m amazed at how many people sent me happy birthday wishes! My replies written, I pack for our outing. Bridget and Spike climb into the PTV and I toss in the camp chair. We go through the town of Elephant Butte and turn right onto Rock Canyon Road. It’s not far to Hot Springs Landing. The wide sweep of sand extending down to the shoreline was once the lake bed. Spike and Bridget are yipping to get out, so I play it safe and park away from the lake. I let them out and we climb up the small hill (to the right of the photo above) to look over the area. Wow! What a great spot for photos! We see several campers along the shore. I take the three photos shown here and then . . . “Low Battery.” Oh, no. Not now. We go back to get our beach gear. Spike gets something in his paw, stops, pulls it out with his teeth, and off he goes for the water! Nothing’s going to stop him! I set up my camp chair in the water and Bridget comes in alongside. The dry heat is pleasant. I like this place. My mind turns to what we’ll do next. 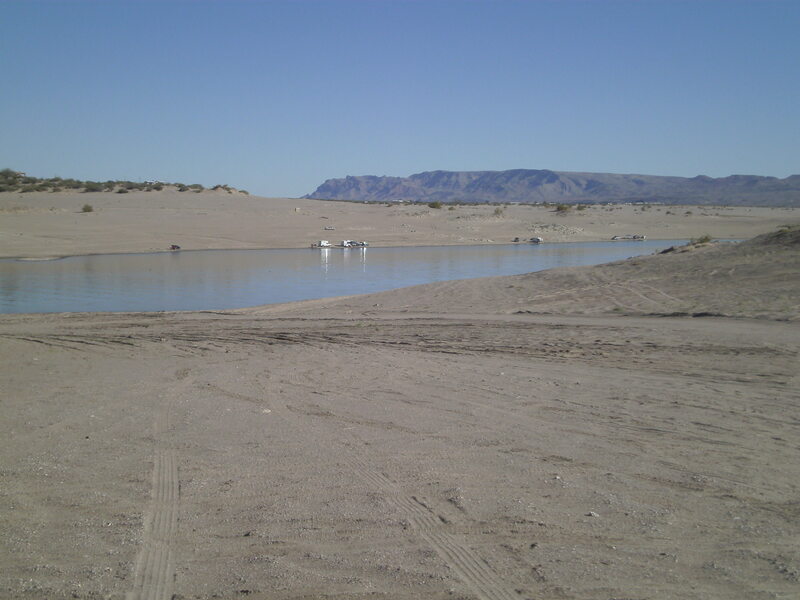 We could stay at Elephant Butte a few more days before we hit the 21-day limit. I called Chip at Baker’s RV Service the other day and told him I needed more time to figure out exactly how I want the solar panels installed. You see, I’ve received many different suggestions from several helpful people. I thought I knew what I wanted when Chip came out to my campsite. Now I’m not sure. Should I put the panels on the PTV or the Casita? Should the batteries be inside the Casita? Inside the PTV? On the trailer tongue? If the panels are on the Casita, how should they be mounted? What kind of batteries should I buy? Where do I get the best deal on panels? Do I really need solar? Is it too much money? Is it worth it? This decision is weighing me down! Before we reach the day limit, we’ll go to another park south of here and come back in a week. (You have to be gone at least six days before you can return to a state park.) That will give me time to decide what I want regarding the solar set-up. I clear my mind and allow myself to enjoy the morning. 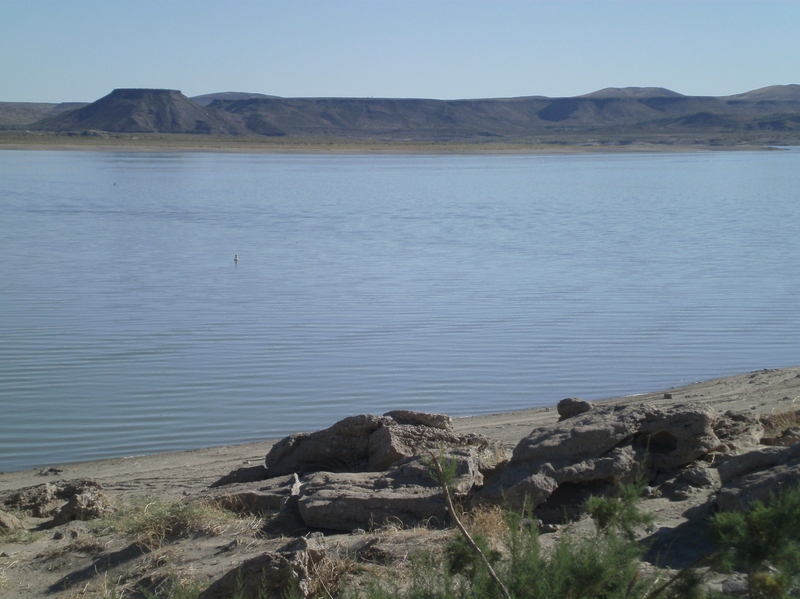 October weather is perfect at Elephant Butte. This entry was posted in Bridget The Widget, Casita, Simple living, Spike The CoPilot and tagged Elephant Butte, Hot Springs Landing, New Mexico, solar power. Bookmark the permalink. Re: dead camera battery. If you get a small cheap inverter from Walmart to plug into the cigarette lighter on the PTV, you will never be without a quick charge. For the camera, the phone, the laptop, whatever. The trouble is . . . . The inverter doesn’t work when the camera is at Hot Springs Landing and the inverter is back at the campground! I have an inverter for the phone, the laptop, the camera, the GPS, and the kindle. That’s why I say get a cheap one just for the PTV. And leave it there. I guess that’s the only solution. I’m not going to get any better at remembering to bring it with me .. .
What a fun day for you. I said I’d let you know how the Wave 3 heater works and we’re really happy with it for boondocking. We open the fantastic fan about an inch and open the window at our feet about an inch and the Wave 3 takes the chill off the Casita really quickly especially if we’re also heating water for coffee! We choose NOT to sleep with it on although it should be safe with the ventilation mentioned above. Just our preference. We have a great sleeping bag that we use as additional cover when boondocking and were snug as a bug in a rug at Wild Rivers Recreation Area when the temp got down to 27 outside at night. Headed out in the general direction of the Grand Canyon tomorrow with stops along the way as stuff seems interesting. Meteor Crater is the first thing to catch our interest. I think delaying the solar is a good idea for now. It’s something you probably want down the road but you can camp a lot of nights with electric for the price of solar and you’re a conservative battery user. Right in the neighborhood with the Meteor Crater is Wuputki , old Indian ruins worth the visit. Also you will be near Cameron Trading Post…. best Navajo Tacos in the world! Hi Sue, Were you able to go swimming at Hot Springs Landing??? Any “hot springs” at the landing?? Glad you and the crew had a good day off! Hi, Geri . . . I don’t know why it’s called Hot Springs Landing. I went in the water and it was cool! It was probably named after the town. TorC used to be Hot Springs. RE: solar panels – If you are vacillating on a decision, best to wait until it is clear in your mind. 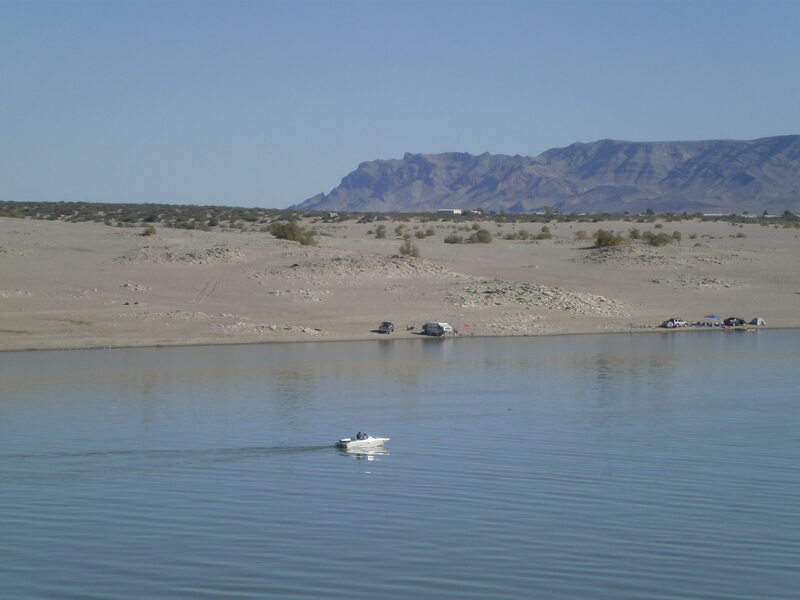 Elephant Butte sure looks like a nice place to just kick back and enjoy some warm autumn days. Love reading about you and The Crew. When I find myself changing my mind several times, I know I’m not ready to make a decision. If I press ahead chances are I’ll make the wrong one. Then again we could just look at the battery indicator. Every bit of technology I own requires a different charger! I have a box full of wires . . . Um, couldn’t all these things have a standard size, like wall outlets and electrical plugs. Always nice to hear from you . . . Thanks a lot, Christopher. I will check these out. I don’t know if you caught your answer on mfgrv or not, but here it is. I’m looking for info posted on a forum by a guy who put solar panels on his van to supply power to his travel trailer. He gave detailed instructions and photos. I have a Chevy Express van towing a Casita LD and I want to put the panels on the van. I’ve run searches on this forum with no luck. Do you know who this person is or where I could find that post? Thanks so much. Yes, I did that with my Aerostar minivan. I ran the solar panel wire down to my 7 pin connector on the van, using two unused terminals in it then ran those two wires to my solar controller which was built into my trailer battery box with the battery. My panel was mounted using an L-shaped bracket on the front and back that screwed into the cross members of my van roof rack. It was very secure, and could easily be removed in the winter or when I sold my van. I also made a 20 foot extension cord using a standard outdoor extension with a 7 pin connector on each end. This attached the solar panel to the trailer when we were camping and the van was removed from the trailer hitch. It worked very well for me. I could park my van in the sun while parking my trailer in the shade. The obvious advantage is that I always drive in direct light when towing on the road, so the battery charges up every time I tow as well as when camping. The only drawback was that I had to have the van attached to the trailer by the umbilical cord in order to charge while camping. However, there was only one occasion where I had to park so far away from the trailer that I was unable to hook it up, and then it was only for a day or so, so the battery recharged when I drove home. At the time there were different points of view regarding the desirability of permanent mounting, which were expressed in various ways. However, it worked very well for me. When I got my new trailer last year, I mounted the same solar panel on the trailer roof using VHB tape, which has also worked flawlessly. For me, convenience is far more important than being able to maximize the solar output by portability, although other people have different priorities. Whatever works for you is what would be best. Hello, Bill . . . Thank you!!! This is the guy I was thinking of. I read his post in a forum a long time ago and couldn’t remember who it was or where I read it. I’m going to click the link as soon as I’m done with this reply. I saw that you are thinking of putting your battery’s inside your van. PPL is the same company that Chip referred me to for the solar kit and the vented battery box.